Campervan Rental Western Australia – What to Expect? Are you interested in renting a campervan, but a little nervous about what to expect? If that sounds like you, you’re not alone. Most times, our first-time campervan rental customers are excited and nervous at the same time. They’re excited to try something totally different, but nervous about “roughing it” in the open air. Is Camping Really “Roughing It”? In Australia, we often refer to camping as “roughing it”. That’s because you sacrifice some luxuries and live “rough” in bush land for a few days. In most cases, camping involves pitching a tent in the bush with no toilet, shower or running water. If all you have is your tent, then yes camping really is “roughing it”. 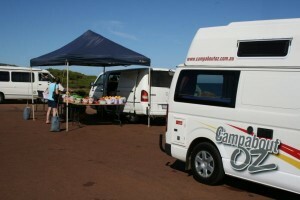 But our campervan rental in Western Australia, gives you many creature comforts to enjoy. Renting a campervan gives you the opportunity to “go camping” and explore the great outdoors with all the creature comforts of home. The little things that make life easier include an indoor-bed, storage areas, a cook top, a fridge and more. Some of our “luxury” style campervans even have a shower, toilet and DVD player. Our luxury campervans supply power to the fridge and microwave, etc. using a dual battery setup that keeps the appliances battery separate from the engine battery. The auxiliary battery charges during driving, so you’ll be able to use the campervan’s electrical equipment when you’re off the beaten track. You can also plug the camper in to the mains power at any properly equipped campsite. You should be aware that most campsites that supply mains power will charge you a fee to stay overnight. The fee will vary a lot depending on the quality and features of the camp site. For example, if the campsite is in a small town you can expect to pay less. If the campsite is in a well known tourist town and has a well known brand (such as Australia’s “Big4” Holiday Parks) with camper’s kitchen, power, bathrooms, etc., then the fee will be higher. Even if you’re an amateur camper, you’ll love travelling in a campervan. Our experienced staff will give you a “tour” of your rental vehicle before you set off on your journey – so you’ll know how everything works. The vans are finished with absolutely everything you need, including cooking utensils, cutlery, pillows, blankets and more. We’re proud to hear our customers say that renting a campervan was “The best fun ever”. And it is fun! With campervan rental in Western Australia, You can travel at your own speed, stopping off to sight-see, take photos and enjoy popular tourist spots – as well as lesser known hideaways. If you’re looking for a unique, fun, totally relaxing break from the norm, you cannot beat campervan rental for exploring Western Australia and beyond. Give our staff a call, or email us, and we’ll be happy to advise on the best vehicle for your needs. We look forward to hearing from you soon!